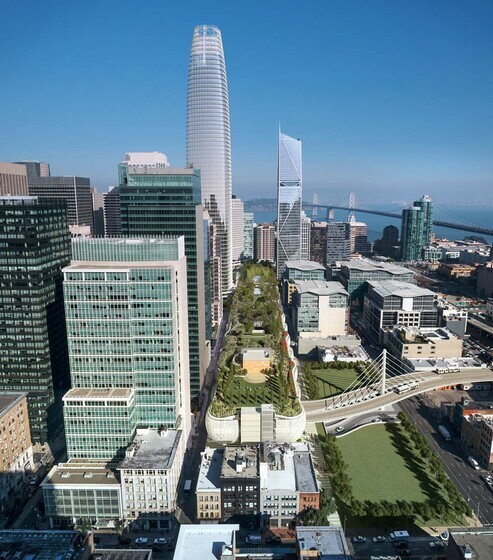 More than 11 years after starting the competition, our ambitious Salesforce Transit Center will open in downtown San Francisco on August 12th. To celebrate the upcoming opening, Claire Maxfield will speak on August 4th at the symposium “A New Paradigm for Urban Design in America: Public Transit, Neighborhood Building, and Visionary Architecture”. Claire will be part of the opening panel titled “Salesforce Transit Center: A Laboratory for Sustainable Urban and Economic Development”. She will be joined by Alison Isenberg, Ph.D, Professor of History from Princeton University; John King, Urban Design Critic for the San Francisco Chronicle; John Rahaim, City and County of San Francisco Planning Director; Mark Zabeneh, Senior Program Manager and Executive Director of the Transbay Joint Powers Authority; and Adam Greenspan, Design Partner of PWP Landscape Architecture. Atelier Ten was instrumental in defining key project goals for energy use and carbon emissions reductions, water conservation, comprehensive waste management, use of sustainable and durable materials, and sustainable design education.